If I could eat one thing for breakfast for the next year, noun it would be Zucchini Blossom & Mozzarella Baked Eggs. I don’t know what it is about zucchini flowers that I love so much. Maybe it’s because they’re only available for a short time, see or because they’re so pretty and, information pills well, flowery. If you can get your hands on some, buy them up! 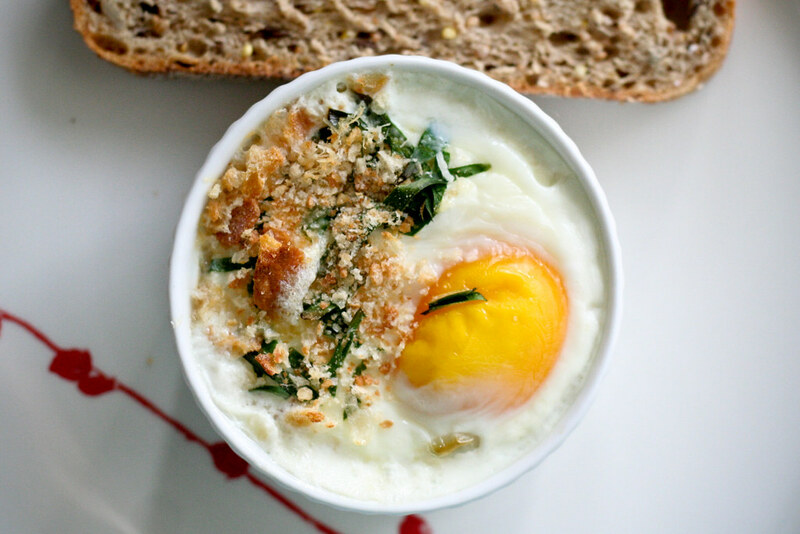 If you can’t get them, you can still make these baked eggs by using a little more zucchini. Still delicious and a great way to use up the overwhelming surplus at the end of the summer. Mild zucchini and its blossoms pair perfectly with salty fresh mozzarella, rich egg yolk and crisp Parmesan breadcrumbs. I added a sprinkling of garlic chives to emphasize the season and add a little extra color. If you can’t find garlic chives, regular chives work just as well. These eggs are light and beautiful and seasonal. Just the thing for Sunday Brunch or my favorite – breakfast for dinner. If you can’t find zucchini blossoms or they are out of season, just add some more zucchini or omit altogether. Preheat the oven to 375° and grease 6 ramekins. If you don’t have ramekins, just make little piles in a greased 9 x 13 baking dish. If you use this method, your eggs probably won’t cook evenly, so some will have softer yolks and some will have firmer yolks. You may also have to cook them a little longer until the whites are set. Fill each ramekin with equal amounts of zucchini, zucchini blossom, cream and mozzarella. Carefully crack an egg over each one, making sure the yolk remains intact. (It’s not the end of the world if it doesn’t – it will still taste great!) 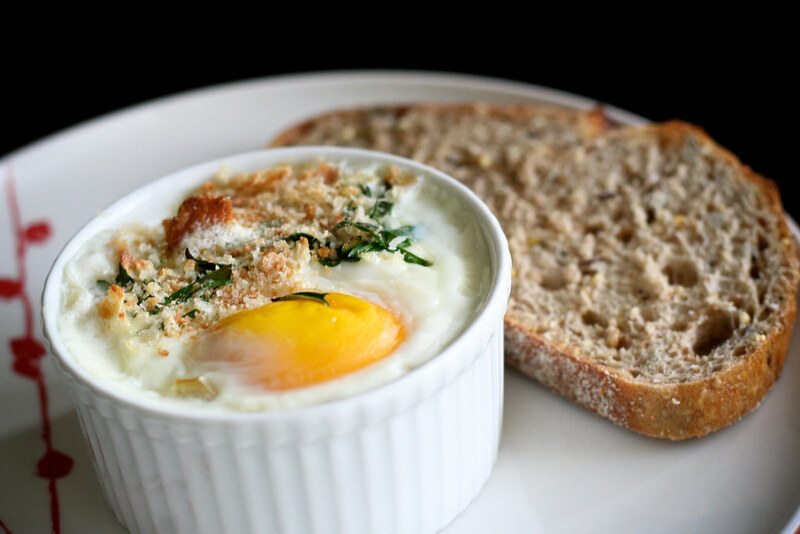 Sprinkle the top of each egg with breadcrumbs, chives and Parmesan cheese. Carefully transfer to the oven and bake for 12 minutes, or until the whites are just set. Remove and serve with toast for dipping! Dear Melissa – What a wonderful corner you have here. Gorgeous recipes! I have always wanted to do a fritti with zucchini blossoms but they’re hard to find, aren’t they? OMG, how did you know?! I’ve been craving baked eggs like nobodies business. I don’t have zucchini blossoms, but I’ll bet some spinach would do nicely. Sounds divine! holy moly! this looks beautiful! i love squash blossom pizza so i know i’ll love with eggs, especially baked eggs. Zucchini flowers haven’t QUITE hit the east coast yet, but when they do, I know what I”ll be making! This is bitchin’. I love eggs! Awesome photography. I use my extra-large muffin pan instead of ramekins. Getting them out can be a little tricky but so worth the effort. I love baked eggs, and I love squash blossoms, so this recipe is perfect. Not to mention beautiful! Delicate and beautiful, fried squash blossoms were a special treat that my grandmother always served during the summer months when zucchini grew rampant in the garden. This recipe takes me back to that time. Louise – Thanks! Yes, they’re the same or very similar. I would google squash blossoms and see if they look the same as yours. Good luck and happy gardening!